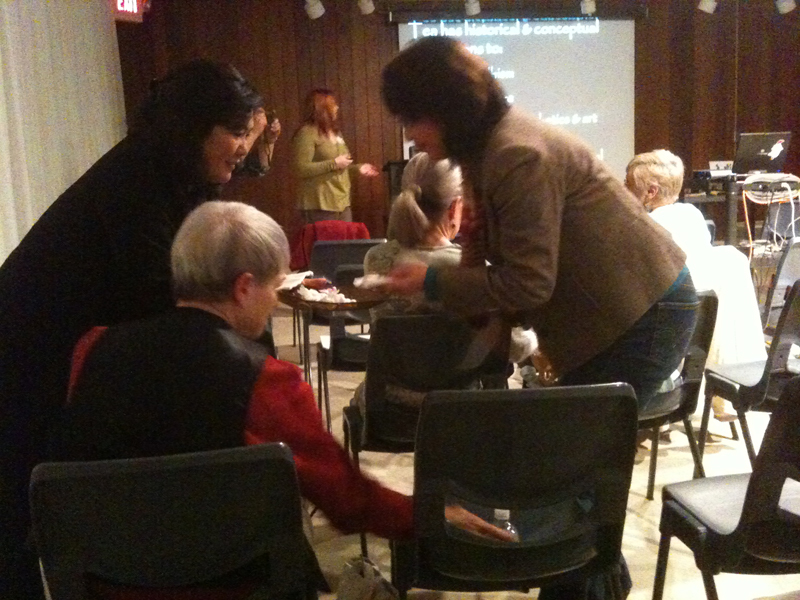 Tuesday, 22Mar10, I attended another general meeting of the Heart of America Japan-America Society. I took several pictures, but unfortunately in a mix-up they ended up being deleted before I could use them, and I found and added them to this blog a couple weeks after I initially posted it. Preceding the meeting there was some of the usual pleasant conversation and snacks. Then Jim, the current HoA-JAS presidnt made some announcements about the upcoming garden clean-up. Other officers made reports on various things, notably a 4-H festival upcoming in Riverside and the JAS student ambassador program. The guest speaker tonight was Mindy Varner, a doctoral candidate at the University of Kansas who is studying pre-modern history of Japan, focusing on the political role that the tea ceremony played. 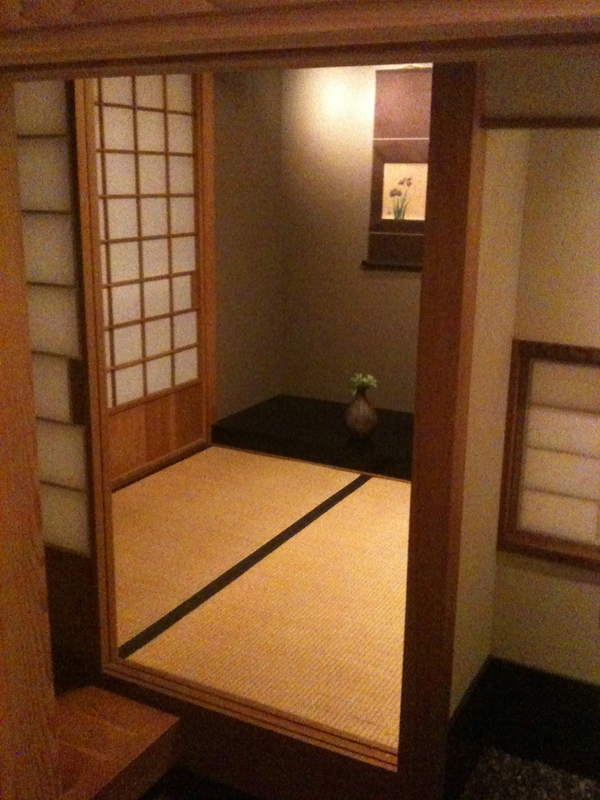 She is also a student of the Urasenke school of Japanese tea ceremony, one of about twelve mainline schools. The tea ceremony in general was her presentation topic. 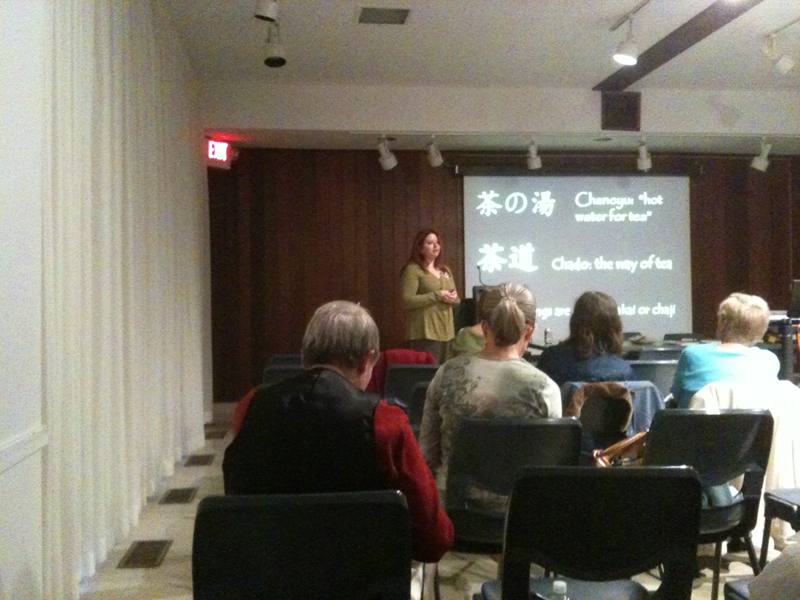 She gave an interesting lecture on the history of tea and the tea ceremony, and both the secular and religious aspects. She described the importance of the tea ceremony and how it was mostly practiced by men who were demonstrating their “cultural literacy” up until the WWII period, and how in the post-war period (side note: how long ago does the war have to be before we stop referring to it so consciously?) it has become a practice mostly practiced by women, though due to traditional transmission of school authority most of the tea masters remain men. There were some other tea ceremony students in the room, and they were whipping up a batch of tea for us to sample. Real tea is green and rather unappealing to look at. It is also very bitter, though the caffeine content readily explains how such a bitter drink became popular. I had tried it before at a friend’s house, but what I received this time that I didn’t then was a ball of sugar that I was instructed to melt in my mouth immediately before drinking. That made a world of difference, changing the flavor. I did not experience the caffeine rush that was described, but this was the thinner version of the tea, so perhaps that and the fact I have the American habit of drinking soda probably minimized that. Also the picture at the start of this paragraph is of Loose Park’s very own Japanese tea room. Check it out sometime, it’s very nice. The presentation was long and detailed, so there wasn’t anything else going on. I had very little sleep the night before and was ready to go to sleep right there. The tea probably kept me going until I could reach home! But it was a good thing, and once again I had a fun and educational time at the JAS.